It's Never Too Late To Start . 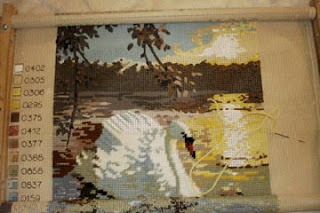 . .
a project, be it a blog, a book, or a needlepoint. These pictures you see below? They are taken of a needlepoint I bought from the famous Needlewoman's Shop in London in 1979. When I was 14 and had saved up all my house-cleaning and baby-sitting and oddment-earning monies one year and went with my school's drill team and band to Newcastle, England, in the first-ever Friendship Force exchange program. Yup, that's when it all started. The Friendship Force, that is, and I'm proud to say I was a part of it. So at the tender young age of 14, being a sophisticated needlepointer, I ventured into this big shop. Full of screen-printed needlepoints from floor to ceiling. 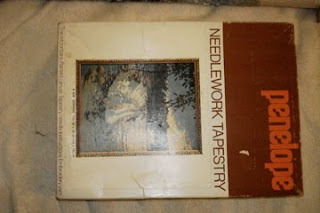 I wanted to buy something for me and my mother, who had taught me all the needle arts, so I looked. And looked. And perhaps caught some of the salesladies' eyes who thought perhaps I was up to no good, I was looking so long. And you know, choosing a piece to stitch was hard! It really was. The European/British pieces were different in style from the American pieces I had seen, and I was a bit intimidated by the enormous selection. I finally settled on 2 pieces, canvases complete with yarn and instructions, that came folded in a box. I was so proud of my grown-up decisions and ability to withstand the teasing from my fellow students about the amount of shopping I had done with my saved up monies, and I managed to bring these boxes all the way back to the States, ready to show my mother what I had bought for the two of us. That moment was a typical moment for us, really, and has been one of the examples I use to show my friends how unthinking and quite unkind my mother could be. Her response when I brought these two boxes to show her? "Well, I don't really like either one of them. I guess you bought the swans for yourself, so I'll just take the other one." 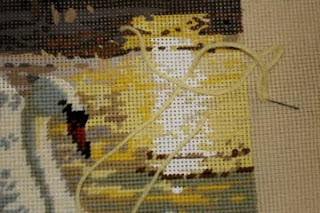 But this is not a post about my difficult relationship with my mother; it's about stitching projects like the swan piece, entitled "Sunrise," no matter how much time has elapsed since buying them. I found the companion piece to "Sunrise," entitled "Sunset" when cleaning out Mom's home after her death, and both pieces are in my "to be stitched stash" even 30 years later. In one way, I'm glad I waited as long as I did, when I have a bit more skill and a few more resources and a lot more experience with kits. Like, they never have enough yarn. Heck, for that matter, even the canvases that call for "x" number of skeins of DMC wool (which you can't find in Atlanta any more - I've tried) or Persian or Appleton are often wrong. 'Member that piece I posted about buying in Quimper, France, in 1997 and stitching during the evenings of spring and summe r 2008 before I closed the shop?? I ran out of one of the colors of DMC wool earlier this year, short 75 stitches from completing it. 75 stitches! That's all! (Webmaster Bill counted the empty holes one evening, that's how I know.) And then began the mad dash calling all of the needlepoint stores in town, none of whom carry DMC wool. I finally had to buy a skein on-line, but at least I finished it, and here are the pictures of the tiny little bit of stitching I had to do before it was all over. Note to former customers: yes, yes, I really did feel your pain when you were in this position. The part I hadn't finished was underneath the handle of the copper pot. The picture is a little dark, I know, but the holes are more pronounced. So, on to the Sunrise swans. I used the Rolaframe frame from the above piece of needlepoint so that it would stay square and be more manageable to work on. 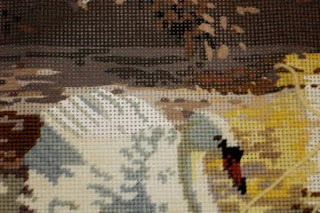 It's a BIG piece of needlepoint, and working on a frame keeps the edges of the canvas tucked away so you don't have to mess with them or wo-man handle them. And learning the lessons from the still-life above, I'm stitching the entire thing in tent stitch (where the back goes up and down) rather than continental stitch (where the back is slanted like the front) to conserve wool. The shades of Anchor wool are 30 years old, and I really don't want to have to stitch large sections of this piece with borrowed colors or go hunting on e-Bay for one color out of a huge stash. I did find one flaw in the colors that came with this piece, though: one of the color numbers had two numerals switched, so the wrong color of wool got put into the box. Had I not had the experience of customers running to my shop with a panic-stricken look on their face I would probably not have known what to do. But I did! I ran (well, drove) to my storage unit armed with some Anchor-to-Paternayan conversion sheets from the internet, and still made my own decision about which color I was going to use, based on the color-scheme in the piece itself. The part that is rolled beneath the swan shows more early-morning water with the swan's cygnets around her. You can see the highest one to her left (your right). This is some detail of the swan herself. She's not entirely white, as my 14-year-old mind couldn't understand, because of the light source coming from her other side. Something my artist friends have taught me. The blues and greens that are her darker shades give her an outline and some definition. Sooo many shades of yellow in the sunrise-on-the-water section. It was a bit hard to distinguish one shade from the others on rainy or cloudy days, when the sunlight was less. She's still coming along quite nicely and I'm enjoying stitching her. Immensely. I feel so glad that she is out and showing the world her stitched self, instead of sitting in a box, languishing away, for another 3 decades. Next on my stitching agenda for my weekend mornings stitching sessions is a Hardanger ring box I bought at market years ago. The kit came with the fabric, thread, and instructions, and a pretty cut-glass ring box to go on top of the stitched piece. The store-bought lace on my dressing table is ready for the yard sale bin, and I'm excited to have both a current stitching project AND a piece ready for stitching, too. Have a great new year, and will post more early in the new year!